Can one woman challenge a corrupt President and a Russian conspiracy? "A riveting thriller built on ruthlessly factual criticism of the Trump presidency." Madison Padgett is fighting to save her dying coal town. Nothing will stop her--not even allying herself with a president she loathes. But she's blocked by Conrad Vega, the young, idealistic Democratic senator determined to save humanity from a global warming catastrophe. Violence explodes, and Madison must challenge her own beliefs while racing to save a country plunging toward civil war--unless the treasonous plot in the White House is exposed. Now, she must unravel a twisted conspiracy while her ideals of respect, truth, and hope drive her toward the ultimate confrontation. If she fails, America--and all it stands for in the world--will be destroyed. 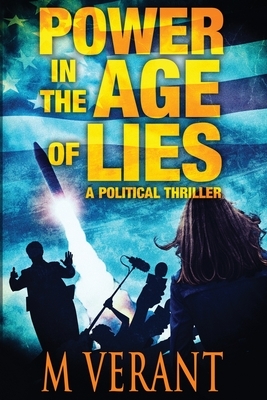 Exciting, provocative, and unabashedly liberal, POWER IN THE AGE OF LIES is an action-packed political thriller. In an era of unprecedented dishonesty, enter a new world where heroes believe in truth, and fight for the rights of all. "I had trouble sleeping last night after I finished this book. It is a relentless thriller. The characters are ripped out of today's headlines. The author keeps the suspense building and building. I really enjoyed this book even if it did scare me to death." "Put aside Patterson, Baldacci and Grisham and give Verant a look." "I was totally sucked into the characters and the plot. The future Verant sketches, with California leading a break-away resistance, seems terrifyingly plausible." "If you are a fan of Nelson DeMille then this book is for you. I turned off the light pretty late as I raced to the ending."